We were happy to talk at home for the Paris Kafka meet-up on January 15th. Every month, we gladly host Meetups within our offices in Paris, and this January, we started the year right by welcoming the Kafka community. 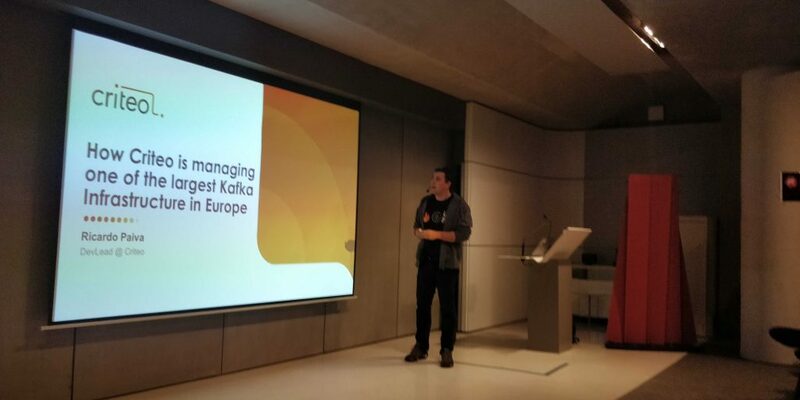 Being one of the biggest Kafka users worldwide, we couldn’t miss this opportunity to present the challenges we face and how we solve them using Kafka. Sharing the technicity of our challenges, explaining how we made technical choices and following up on the results, whether successes or pitfalls, is part of the Criteo R&D culture on how we choose to give back to the community. Criteo’s first Kafka cluster was deployed 4.5 years ago to prototype a streaming application with Storm. Three years ago, it replaced our whole business logging pipeline to feed data into our centralized data lake. Today, we are using several streaming frameworks for our data workflows and for replication, namely Kafka Connect, Kafka Stream, and Flink.